The objective of the present study was to examine the influence of cosolvent system and microemulsion formulation on in-vitro skin permeation of gabapentin, furthermore, to characterize the physicochemical properties of drug-loaded oil-in-water (o/w) and water-in-oil (w/o) cremophor 40-based microemulsions in comparison to the blank counterparts. The cosolvent system prepared by homogenous mixing is composed of ethanol-water and propylene glycol-water mixture (90:10, 80:20, 70:30 v/v) respectively. The microemulsion consisted of coconut oil, water and mixture of cremophor 40 (surfactant) and ethanol (cosurfactant) and was prepared by aqueous phase titration method. Physicochemical properties of microemulsions were determined using reported procedures. Transdermal flux for gabapentin was studied in-vitro using modified Franz diffusion cells. The physicochemical properties of drug-loaded microemulsions and their blank counterparts were generally alike, however, slight variation in pH and viscosity was observed probably due to the intrinsic properties of the drug. The ethanol-water system (70:30 v/v) gave higher flux for gabapentin when compared to propylene glycol-water system (70:30 v/v). The w/o microemulsion formulations resulted in, higher flux for gabapentin when compared to o/w formulations. FTIR spectra of the untreated stratum corneum, when compared to cosolvent system and microemulsion treated stratum corneum, suggest the mechanism of permeation to be disruption of lipid bilayers and keratin denaturation of the stratum corneum. The results show that incorporation of gabapentin into microemulsions did not change the microemulsion type. The in vitro permeation data obtained from experimental work suggest that the cosolvent system (ethanol-water 70:30 v/v) and w/o microemulsion formulations respectively, can be successfully used as potential vehicles in developing transdermal therapeutic systems for gabapentin. The in-vitro study on permeation of drug through the skin is very vital in the selection of candidates for the development of transdermal dosage forms. Investigations of this type are generally done by using a diffusion cell whose donor and receiver compartments are separated by a membrane. Such membranes could come from human skin (cadaver or surgical reduction), mice, pigs, rabbits and rats  . However, the main barrier to drug permeation through any of these membranes is the stratum corneum (SC) that has been reported to differ in terms of lipid composition, water content and morphological characteristics (thickness, number of pores and follicles). To overcome this barrier to transdermal delivery, formulation scientists have investigated a number of techniques such as chemical enhancement  - , microemulsions  - , nanoemulsions  - , cosolvent systems  - , ethosomes   and organic solvents   . Gabapentin, 2-[1-(aminomethyl) cyclohexyl] acetic acid is an excitatory amino acid antagonist. Clinically, the drug is used orally for the treatment of postherpatic neuralgia and adjunctive therapy for partial seizures  . As gabapentin is not appreciably metabolized, has short plasma half-life and its bioavailability inversely related to the drug dose, gabapentin was considered a potential drug candidate for percutaneous absorption. Therefore, the aim of this present study was to investigate the effect of cosolvent system and microemulsion formulation on the permeation of gabapentin in order to select a potential solvent system towards developing a transdermal therapeutic system. Gabapentin (Pfizer, China), cremophor RH 40 (BASF, Germany), purified coconut oil (Nigeria), ethanol (Sigma and Aldrich, USA). All other chemicals and reagents were of analytical or high-performance liquid chromatography (HPLC) grade, purchased from Sigma and Aldrich (USA). Ethanol and water or propylene glycol and water were homogenously mixed in different ratios to obtain binary solvent systems of 90:10, 80:20 and 70:30 v/v respectively. A pseudoternary phase diagram was constructed by using the aqueous phase titration method  . Two optimized formulations were selected at surfactant:cosurfactant ratio of 1:1 and 1:2 respectively, that were likely to produce both o/w and w/o microemulsions. The w/o and o/w microemulsion formulations were designated as MEa and MEb respectively, for 1:1 surfactant:cosurfactant mixture ratio; MEc and MEd respectively, for 1:2 surfactant:cosurfactant mixture ratio. Optimization of microemulsion was in terms of droplet size and polydispersity index. Gabapentin was incorporated at a concentration of 5% w/w to the microemulsion formulations by combining appropriate amounts of each component and mixed by vigorously stirring for 5 minutes. The samples were characterized and compared to their blank counterparts. The apparent pH of the formulations was measured in triplicate at 25˚C using a pH meter with combination electrode (Eutech, Japan). The determination was carried out using photomicrograph (Moticam, Japan). The test was performed on a filtered microemulsion sample that was placed on a slide after being diluted with distilled water. The filtration was done through 0.22 mm membrane filter. Polydispersity index was estimated from the ratio of standard deviation to the mean droplet size. Viscosity of the samples was measured at 25˚C using, a cone and plate viscometer (UTV Gallenkamp, England). A sample volume of 5 ml was used for the viscosity measurement and the test was carried out in triplicate. Surface tension of the samples was measured at 25˚C using Du Noüy tensiometer. A sample volume of 5 ml was placed on the tensiometer plate and the force required pulling a circular ring out of the sample recorded. The test was performed in triplicate. Stability of the samples was studied by allowing the microemulsions to stand on the laboratory shelf for 21 days while observing them for phase separation and/or creaming. The approval to carry out the animal studies was obtained from Faculty of Veterinary Medicine, University of Nigeria, Nsukka animal ethics committee. Male Wister rats were sacrificed with prolonged exposure to chloroform. Hairs on the skin of animal were removed with electrical clipper. Full thickness skin was surgically removed from each rat. The epidermis was prepared from the full thickness skin by heat separation technique  that involved soaking entire abdominal skin in water at 60˚C for 1 minute. The epidermis was cut into 4.5 × 4.5 cm2 pieces and used for the permeation study. The unused epidermis was wrapped with aluminum foil and stored at −20˚C until needed. Prior to being used, the stored epidermis was allowed to thaw, cut into 4.5 × 4.5 cm2 pieces and hydrated by placing in phosphate buffer saline (PBS) overnight before use  . The studies were done using modified Franz diffusion cells. The diffusional area of the cells was 2.54 cm2. The diffusion cells were connected with a circulating water bath and the temperature was controlled at 37˚C. Phosphate buffer saline (PBS) used as a receiver fluid was placed in the receiver compartment that has a volume of 25 ml and was stirred by an externally driven Teflon-coated magnetic bar. The prepared epidermis was sandwiched between the receiver compartment and the donor compartment with the stratum corneum facing upwards. The donor compartment was clamped. One ml of cosolvent system containing 5 mg of gabapentin or drugloaded microemulsion was applied onto skin surface facing the donor compartment that was covered with a glass lid. The sampling arm of the donor compartment was also covered with aluminum foil. At suitable time interval (0, 1, 2, 4, 6, 8, 10, 12 and 24 h), 1 ml of each sample was withdrawn from the center of the receiver compartment with a syringe connected with a needle. An equal volume of fresh PBS (37˚C) was replenished immediately. The amount of drug in the receiver fluid was determined spectrophotometrically at 210 nm. The concentrations of gabapentin permeated to the receiver fluids were quantitatively determined by UV/VIS spectrophotometer (Jeenway 6405, England). The samples were analyzed at maximum wavelength of 210 nm. The calibration curve (absorbance versus drug concentration) was constructed by measuring standard solutions of the drug in PBS in the concentration range of 5 - 50 µg/ml. Validation of the method was performed to ensure that the calibration curve was in the linearity range of the assay and the coefficients of variation were less than 2% both intra-day and inter-day. The rat stratum corneum samples were prepared by soaking freshly prepared epidermis membrane in a 0.1 % trypsin solution for 12 h. The SC samples were cleaned by washing with distilled water and blotted dry and used in the FTIR  studies. The analysis was performed on both untreated and treated rat stratum corneum. The vehicle-treated and untreated (control) SC samples respectively were vacuum-dried at 25˚C ± 1˚C for 48 h and stored in desiccators to remove traces of solvent. The control samples were treated in phosphate buffer saline (PBS). All samples were treated in the respective vehicles for 24 h prior to been vacuum-dried. The completely dried samples were studied by FTIR (Shimadzu 8400S, Japan). Peaks occurring near 2850 cm−1 and 2920 cm−1 that were due to symmetric and asymmetric C-H stretching vibrations respectively as well as those at 1550 cm−1 and 1650 cm−1 indicating amides (C=O) stretching vibrations were characterized. Figure 1. 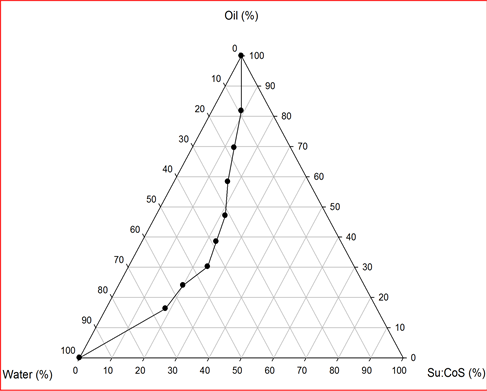 Pseudoternary phase diagram of coconut oil/water/ cremophor 40 RH:ethanol (1:2) microemulsion formulation. Figure 2. Permeation profile of gabapentin in various vehicles. Table 1. Physicochemical characteristics of the microemulsions. *The apparent similarities in the physicochemical properties of the blank and drug-loaded microemulsions (Table 2) indicated that the bulk components (water, oil and surfactant/co-surfactant) of the microemulsion, which control the physicochemical properties of microemulsion have fairly equal effects on the permeation of gabapentin through the excised rat skin; and that the permeation performance of gabapentin in this study is strictly controlled by the nature (w/o or o/w) of the microemulsion. permeability coefficients of gabapentin from cosolvent systems and microemulsion formulations are shown in Table 2. It was further demonstrated that the skin permeation rate of gabapentin from the binary ethanol-water (70:30 v/v) system was higher than that from propylene glycol-water (70:30 v/v) system. However, for ethanolwater systems, the permeability flux for gabapentin in the ratio of 90:10 v/v, 80:20 v/v and 70:30 v/v was found to be 8.434 ± 0.176 µg∙cm−2∙h−1, 14.774 ± 0.409 µg∙cm−2∙h−1, and 63.290 ± 1.62 µg∙cm−2∙h−1 respectively. This may be due to differences in their influence on the biophysical properties of the stratum corneum. With the microemulsion formulations, it was found that the flux for gabapentin from MEa (128.215 ± 1.84 µg∙cm−2∙h−1) and MEc (61.137 ± 0.896 µg∙cm−2∙h−1) were higher than those of MEb (5.542 ± 0.587 µg∙cm−2∙h−1) and MEd (4.728 ± 0.220 µg∙cm−2∙h−1) respectively. 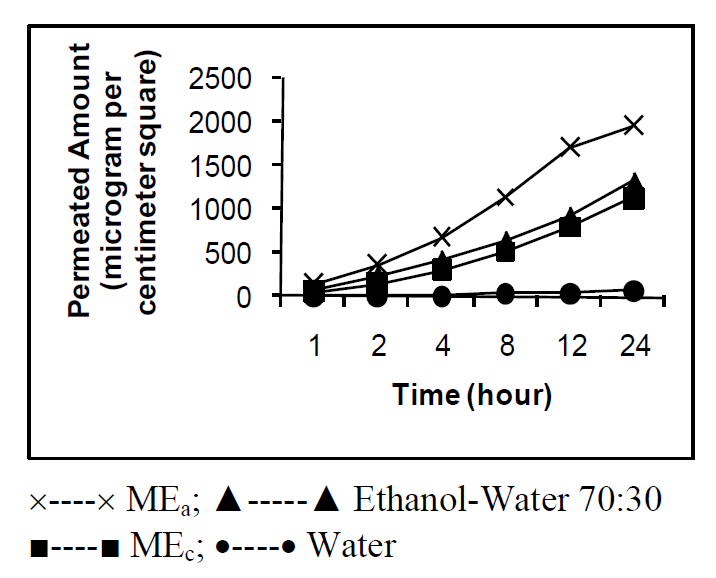 The ethanol-water system 70:30 v/v and microemulsion formulations (MEa and MEc) respectively, provided good permeability and the required flux through the skin for the drug. The results of the FTIR analysis are shown in Table 3. The absorbance values were calculated from the vibration frequency intensities. The untreated SC (control) showed peaks that are due to molecular vibrations of lipids and proteins present in the SC. The absorption bands at 2927 cm−1 and 2860 cm−1 could be attributed to the asymmetric (-CH2) and symmetric (-CH2) vibrations of long chain hydrocarbons of lipids respectively. The two bands at 1637cm−1 and 1580 cm−1 were due to the amide I (C=O stretching vibration), and amide II (C-N bending vibration) respectively, of the SC proteins. With the vehicle treated SC, significant decrease in peak height for asymmetric and symmetric C-H stretching vibrations was observed. The same observation was made for amide I, and amide II stretching vibrations. The peak positions were however, not altered in both treated and untreated SC. The significant decrease in peak height with 70:30 v/v ethanol-water suggests partial extraction of the lipids from the SC. Extraction of the lipids from the SC has been reported   to enhance percutaneous absorption of drugs. Likewise, the significant decrease in peak height with microemulsion type (MEa), suggests disruption of lipid bilayer and keratin denaturation by hydration. Hydration increases permeation flux for both polar and nonpolar permeants by increasing lipid fluidity in the bilayer region; competing for hydrogen-bonding site and lessening restrictions on protein rearrangements   . The increase in permeability of gabapentin observed in this study may be due to increase in, drug diffusivity through the hydrated SC. Previous reports have shown that w/o emulsions enhanced transdermal delivery by hydration of the skin epidermis   . Table 2. Skin permeation parameters of gabapentin through stratum corneum from various vehicles. Table 3. Peak height of asymmetric, symmetric C-H stretching and amide absorbance of rat stratum corneum. Both cosolvent system (ethanol-water, 70:30 v/v) and w/o microemulsion formulations (MEa and MEc) very significantly enhanced the skin permeation of gabapentin through the excised rat skin. Results of the study therefore suggest that microemulsion type (w/o) and cosolvent system (ethanol-water, 70:30 v/v) can be successfully used as vehicles to enhance skin permeation of gabapentin.